You can bring Life’s gentle encouragement towards healthy self-discipline, self-awareness, and self-love into your inbox on a weekly basis with Droplets from Raindrops of Love for A Thirsty World. Sign up here! "SAN FRANCISCO, CA, May 31, 2017 || 24-7 Press Release || — A timely spiritual guide to surviving and thriving in today's pervasive, gloomy atmosphere of alienation and fear, the new book, Raindrops of Love For a Thirsty World, lays out a path to life-long self-actualization, and reconnection through a shared consciousness." A timely spiritual guide to surviving and thriving in today’s pervasive, gloomy atmosphere of alienation and fear, the new book, Raindrops of Love For a Thirsty World, lays out a path to life-long self-actualization, and reconnection through a shared consciousness. 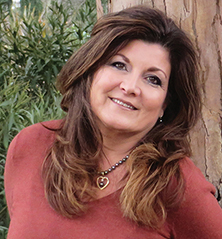 The author, Eileen Workman, has summoned the profound wisdom of The Life Force in a series of loving messages. These communications come at an opportune time, as we drift in a sea of anxiety and worry, deeply shaken by recent political, economic and social crises, and starved for connection due to divisiveness. A decade ago Workman experienced a startling spiritual awakening. Abandoning her high-powered, highly-paid role in the financial world, she opened up to a channeled gift of eloquent, soul-stirring passages from what she calls LIFE –– “The Life Force” –– a field of energy and love that transformed her life and her relationship to humanity. Encourage others to realize that your amazing ingenuity and imagination, when filtered through the perspective of life awareness, holds the power to generate awesome new creative potential . . . This is why I encourage you to trust the living process . . . For you live within a self-organizing, self-scaffolding field of living love that manifests as light. Eileen Workman spent sixteen years in the financial industry as First Vice President of Investments at a major Wall Street firm. After a profound spiritual awakening, she departed the high-powered world of money and wrote Sacred Economics: The Currency of Life, which questions assumptions about the nature of capitalism. The book is about directing our attention toward the purposeful design of a more compassionate, cooperative, and abundantly flowing economic system from a spiritually-driven perspective. 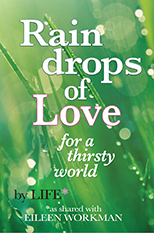 In her new title, Raindrops of Love For a Thirsty World, Workman calls down the wisdom and the words of the Life Force, inviting us to embrace our fullest capacity as a species. Find her at eileenworkman.com.